Grief is an emotion that everyone experiences at least once in their life. For some, it may be the loss of a loved one. For others, it may be the loss of a job or break up of a relationship. Every person deals with grief in their own way. Yet, the Bible provides us with many great references to help when dealing with grief. Grief can be one of the most agonizing, life-altering emotions that each of us will experience during our lifetime. Although grief can have many causes, such as the loss of a job or the break-up of a relationship, the most common cause is the death of a loved one. No matter what the cause, grief profoundly affects different people in different ways. Each of us grieves in a way that is specific to our experience and personality. This makes how we grieve not right or wrong, just part of who we are. GRIEF, noun [Latin gravis.] 1. The pain of mind produced by loss, misfortune, injury or evils of any kind; sorrow; regret. We experience grief when we lose a friend, when we incur loss, when we consider ourselves injured, and by sympathy, we feel grief at the misfortunes of others. 2. The pain of mind occasioned by our own misconduct; sorrow or regret that we have done wrong; pain accompanying repentance. We feel grief when we have offended or injured a friend, and the consciousness of having offended the Supreme Being, fills the penitent heart with the most poignant grief. 3. Cause of sorrow; that which afflicts. How is grief experienced and what can we do to help? Shock is often the first thing that many people experience after suffering the loss of a loved one. Numbness, confusion, and a spoken or unspoken denial of what has happened may overwhelm them. They may experience a shutdown in the ability to think at all, collapse, or even lose consciousness. They might go on “autopilot”, carrying on with routine tasks in an effort to protect their mind from the reality of what just happened. This is when someone who is grieving may need the most help. Spending time with them to help them with their physical needs is very important. Things like preparing meals so they get proper nutrition, taking care of children, or even driving them to appointments such as to the hospital or a funeral home may be needed. The important thing is just to be there to assist in any way you can. Understand that you will probably not even know what to say, just be there as a friend if they need you. Engaging ministry resources to assist in seeking the guidance and strength of God is especially needed to transition successfully though this phase. 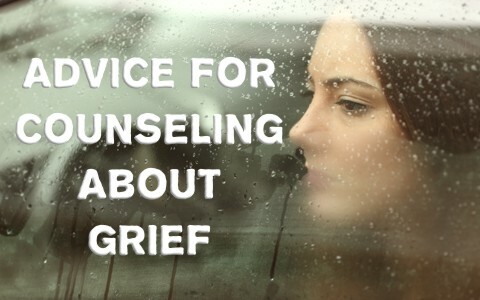 With grieving often comes a period where some may experience anger, resentment, or guilt. Anger, resentment, or guilt may be present out of a desire to blame someone whether-or-not someone was really at fault. These emotions may be directed toward them self, the doctors, God, or even the loved one who died thinking that their loved one has abandoned them through their death. Those who feel these emotions may say or do things they would not normally say or do because their tensions and emotions are heightened. In this phase of grief, the person is trying to make sense out of what happened. Rationally identifying the sources of their anger and resentment as well as exploring to determine if their feelings of guilt are valid is needed. Seeking constructive ways to manage the anger, resentment, or guilt so that it does not become destructive to their well-being or the well-being of others is very helpful. If relationship issues are at the root, get assistance to work with all involved to help them come to a healthy understanding in light of God’s Word so that they may have be able to have a peaceful resolution and reconciliation if needed. Sadness and depression often occur with people who are unable to get through their grief. While it is understandable that with grief they will experience sadness, it is when sadness turns to depression that it can have harmful effects. That feeling of wanting to curl up into a ball and be left alone can be overwhelming, but left unchecked it will become harmful. During this phase of grief, it is important that the person grieving in due time is helped not to continue to focus on their loss, but to focus on what they gained. I once counseled a lady who was morning the loss of her older brother who died while she was a young teen. She struggled for years with grief that caused disruption to her life and made her to no longer want to even attend church. She revealed that one of the things she missed about her brother was how he would sing songs with her ever since she was young. She had a beautiful singing voice and used to like singing worship music. We discussed how her brother had blessed her with a love for singing and that one way she could remember him was to sing in church to minister to others. With this renewed emphasis on using the gift that he helped her develop, she began to sing in church and found great joy and peace in singing for others as it now reminded her of her brother’s love for her. This is a very important principle to keep in mind. It is important to help redirect the focus on the darkness of sadness and depression toward the joy and light of using the memory of what is causing their grief for blessing others. Simple things like keeping favorite holiday traditions, recipes, etc. can go a long way to help with this. Grief is an emotion that everyone experiences at least once in their life. No matter what the cause, grief profoundly affects different people in different ways. When we understand what can happen when someone experiences grief and the Scriptures that can be used to address their grief, it can help them work through their grief with the strength and power of the Lord. Then they can live their life the way God intended them to (John 10:10). Related reading for you: What Does the Bible Say About Grief? Previous post: Did Noah Take Fish Or Water Living Animals Into The Ark? Next post: Who Was Moses’ Wife? Was Moses Married?